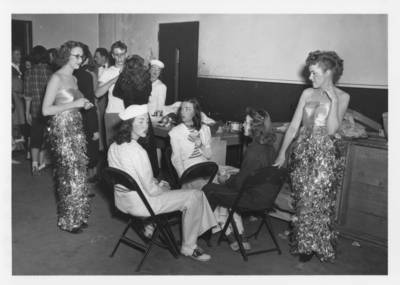 Five female students from Delta Zeta await their performance of "Davy Jones Rendezvous" for the 1948 Flickertail Follies. Three dressed as sailors sit on chairs playing cards while two others dressed as mermaids stand beside them. Several other performers mingle in the background. Established by the Journalism Fraternity, Sigma Delta Chi, as a campus talent and variety show, The Flickertail Follies entertained the city of Grand Forks from 1925-1962. The Follies were, however, suspended from 1931-1935 due to The Depression and from 1941-1945 for World War II. The Follies gained national attention in 1950 when it was featured in "Life Magazine". The show was dropped in 1962 but was revitalized for one year in 1982.